I felt calm as I stood backstage waiting for my cue to host the Girls Can Do Program at the Warner Theatre in Washington, D.C. The usual butterflies were gone as I peeked out at the crowd. This program was special – the audience was filled with girls with baby hairs and afros whose twinkling, curious eyes and wiggling in their theatre seats reflected their excitement. 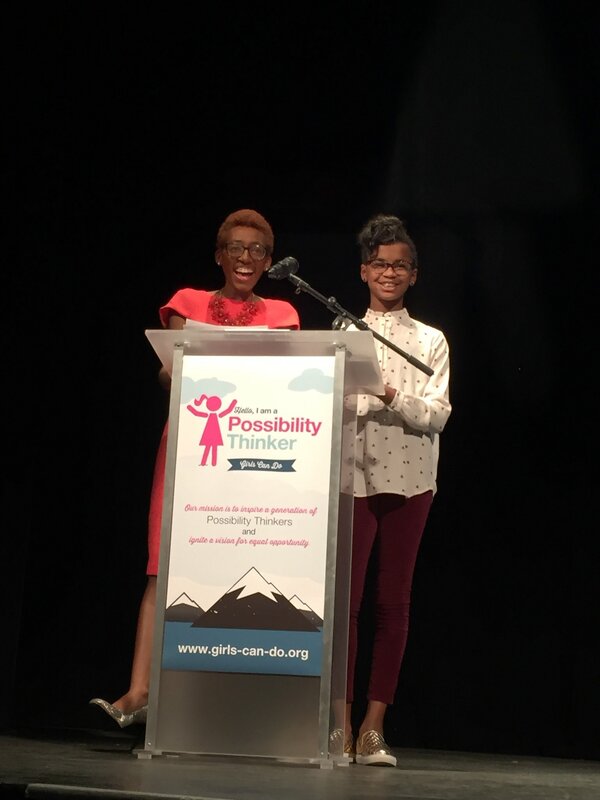 Beside me, my 11-year-old Black girl change maker cohost Marley Dias, the founder of #1000BlackGirlBooks, whispered tongue twisters while reviewing the cue cards I cut and backed onto fun patterned cardstock the evening before. My phone vibrated in my hand as Black women mentors texted words of wisdom and the love and support of fellow Black women leaders, friends and family members overwhelmed all doubts and any nagging feelings of imposter syndrome. As I waited for the clapping of the audience to signal the end of mindful meditation and our turn to walk on stage, I heard the voices of Viola Davis as she accepted her Emmy and reminded the audience that “the only thing that separates women of color from anyone else is opportunity,” Lupita Nyong’o as she delivered her powerful speech at the Black Women in Hollywood Luncheon on how she felt unbeautiful as a child and how representation of women who looked like her –Alek Wek and Oprah – started her self love journey, Ava DuVernay’s advice to “be passionate and move forward with gusto every single hour of every single day until you reach your goal” and, finally, I heard the voice of our First Lady of the United States Michelle Obama reminding girls in the White House and across the world that she was so proud of them and we are all leaders in this world. The clapping began and Marley and I danced onstage with our own baby hairs and afros and reminded the girls of their brilliance and the limitless possibility of every girl in the room to assume critical leadership positions and change the world in our opening remarks. In all ways always, we deserve to take up space, to lead and to unapologetically pursue our passion! As Assistant Director of the White House Initiative on Educational Excellence for African Americans, I have had the honor of visiting thousands of girls at schools and conferences, as well as hosted events for students to unapologetically be themselves at the U.S. Department of Education and the White House. From reminding girls that the queen is the most powerful piece in chess after a screening of Queen of Katwe at the White House, to passing out tiaras to students who are homeless or in foster care with young author Jordan West to celebrate literacy and high self esteem, to learning the Nae Nae as a warm up during a reading party with Marsai Martin and Marley Dias, to discussing gender identity at the White House Summit to Support LGBTQ Youth, to meeting other Black women who evoke that type of shyness where you have to focus all your energy on audibly saying hello, my heart is not just filled with #BlackGirlMagic but with inextinguishable #BlackGirlHope. Today we change tomorrow by investing in our young girls – not just with time and resources, but with love and affirmation. As Black women, I pray that each and every one of us hold our heads high and support one another, that we lead where we are, and we reach back to teach and close opportunity gaps for Black girl change makers all over the world. 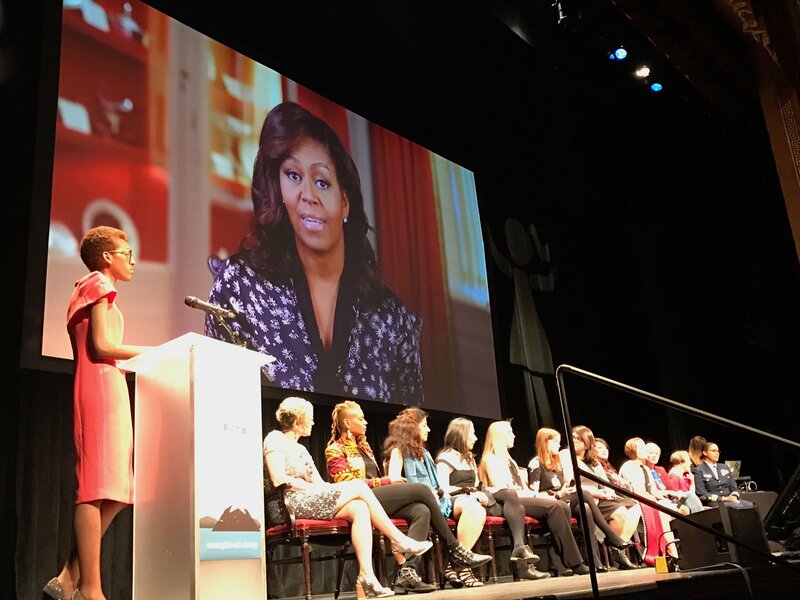 On December 9, 2016, the White House Initiative on Educational Excellence for African Americans will convene over 250 Black girl change makers, black women trailblazers, and sister’s supporters for the White House Initiative on Educational Excellence for African Americans #AfAmWomenLead Student Summit to Advance Educational Excellence for Black Girls. The daylong convening will kickoff with a Black Girl Change Maker panel featuring Marley Dias, April Star and Mikaila Ulmer then transition to small breakout sessions where students will spend hours solving the most pressing issues facing African American women and girls in education under the guidance of Black women trailblazers. Students will craft recommendations for researchers, policy makers and practitioners as THE experts of their education. Simultaneously, adults will meet separately to engage in a discussion of educational excellence and opportunities to support Black girls. The day will end with a Black Women Trailblazer panel featuring Brittany Packnett, Symone Sanders, Dr. Kimberlyn Leary and Cierra Kaler-Jones. It takes a village to support Black women and girls. Join the movement by tweeting about #BlackGirlHope and #AfAmWomenLead and save the date on your calendar to virtually join us on December 9 on Periscope, Twitter and via Livestream at http://tinyurl.com/afamwomenlead. We will post our favorite tweets throughout the event! Then, download our toolkit to host a teach-in to support Black women and girls in your community! Most importantly, reach out and mentor a young girl. We are the hopes and the dreams of our ancestors.